Kenny Speck of Speck and Sons Tree Trimming has rescued hundreds of animals over the years. When 8-year-old twins Alice and Travis Murphy went to bed Wednesday night, they weren't sure if they would ever see their treasured family cat Stormy again. "We don't want to lose her because she's like the cutest kitty on earth," Travis said. [post_ads]Shortly after fireworks started going off Wednesday night in Auburn, Stormy disappeared. She sought refuge in a giant pine tree next door and got stuck. 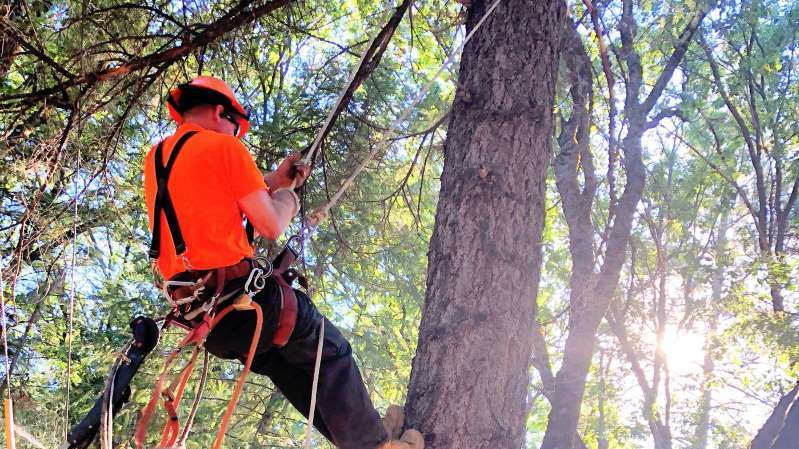 Kenny Speck of Speck and Sons Tree Trimming has rescued hundreds of animals over the years. He got a call Thursday to rescue Stormy. "July 5 is when animals get weirded out from the Fourth of July fireworks," Speck said. "So they'll climb up trees, run away and do different things." As the twins eagerly watched from the ground below, Speck scaled the giant pine. "(Pets) get scared when they're up there all night," he said. "All they hear is the coyotes and all the wild animals. So, it's new for them -- they're scared!" It's not just pets that get freaked out by the loud explosions. Wild animals do, too; some even get injured. "I went out to shut the gate and I noticed an owl struggling -- it couldn't fly," Auburn resident Rick Jamarillo said. The owl's wings were singed. "I picked it up, got it in the cage, contacted the local animal rescue and brought it up here," Jamarillo said. He took the injured bird to the Gold Country Wildlife Rescue in Auburn. Greg Grimm, who is a board member, said the rescue center is always busy receiving and treating distressed animals after fireworks displays. "Take the animal, put it in a box with something on the bottom to keep it from sliding, keep it warm, dark and quiet," Grimm said. "Don't feed it or give it any water and then bring it in." At the Murphy home, Speck made it up the tree close to Stormy, calmed her and then carried her down. "When I get down to the bottom of the tree -- and these kids that have been without the cat, worried and talking about him -- they're just so happy," he said. "That just does it for me." With a big smile on her face, Alice held Stormy close. "I was scared that we were never going to get her back," she said. "I knew she was safe -- but I was still kind of worried."